Coffee remains to be the all-time favorite when it comes to beverage preference amongst fans of quality drinks. Nespresso, a premium coffee is prepared by machines which brew espresso and coffee from its pods or capsules. Competition for market penetration has led to significant advancements in the technology employed in making Nespresso machines. The idea behind these inventions is to keep the coffee lovers in check by providing quality coffee and excellent brewing experience at home. 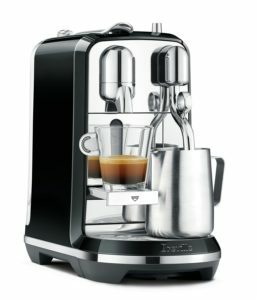 One of the best machine is Breville Nespresso Creatista Plus and even coffee nerds will probably be delighted with Creatista Plus. These machines were introduced into the coffee brewing industry with the aim of improving the taste of Nespresso and its capacity to give a wide range of milk frothing capacities. The Nespresso Creatista Plus by Breville was invented by a merger of innovations by two giant coffee brands; Nespresso and Breville. The former had reliable pod system that allowed brewing excellent quality espresso and black coffee, they but were not satisfactory in brewing textured milk necessary for latte art. This left the machines relying on external milk frothier in case you wanted to brew coffee latte. On the other hand, Breville advanced in milk frothing technology whereby they came with the Breville Oracle which has advanced features in producing textured milk required for latte art. This was made possible by introducing automated high-level self-frothing steam wand capabilities that manifest best results when applied to latte art. The partnership of Breville and Nespresso formed an integrated coffee maker (Creatista Plus) that uses the two combinations to easily prepare top quality Latte Art coffees at home or in your office. Being one of the co-principal tools of the Creatista Plus, the Oracle automates tamping and milk texturing which are the two most difficult parts of manual espresso. Coupled with automatic grinding and dosing, it can texture milk and extract espresso at the same time converting coffee beans to a latte in less than a minute. Frothing Control – Unique to other auto-frothing machines, the Oracle provides an option for precise control of the milk temperature and the type of froth. This enables steaming to stop at a preset temperature thereby extracting maximum flavor potential to the beverage. One Touch Americano – The Oracle has an innovative feature that delivers a double espresso then a dedicated hot water spout that is positioned so that you can make one without moving the cup. This ensures no coffee spills or wastage. Micro-foam Milk – Automated steam wand ensures the milk is textured according to taste and temperature preferences ranging from less texture that forms smooth latte to more texture forming creamy cappuccino. A boiler powers the steam wand enabling it to produce barista quality microfoam that is essential for creating Latte Art. Grinding consistency – An automatic conical burr grinder is integrated into the machine, and it provides easy, precise adjustment of grinding, dosing and tamping. It then polishes the coffee in the portafilter with absolute consistency. This ensures no wastage of the coffee. Breville decided to create two categories of Creatista; Creatista and Creatista Plus. The latter is an improvement of the former with more features and better customization options. The Creatista is pocket-friendly compared to Creatista Plus whereby the costs of production are reduced by combining plastics with steel. They, however, use the same technology in their workability. 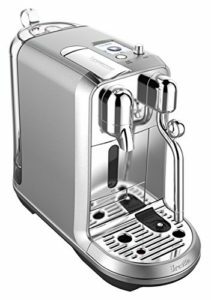 Preprogrammed settings – provide options for preparing cappuccino, espresso, flat white, café latte, latte macchiato, Lungo, and Ristretto. Heating System – has a fully-automatic steam wand that allows perfectly textured milk to be set to preferred temperature with up to 11 selectable milk temperatures. Stainless steel barista milk jug – designed purposefully for Latte Art to provide café quality microfoam. Design: The Creatista comprises a stainless steel front panel with colored sides whereas the Creatista Plus has a full stainless steel body. Heat-up time: Creatista has a heat – up time of 10 seconds while the Creatista Plus has a heat – up time of 3 seconds. Auto-frothing: Creatista has four textures of milk frothing while Creatista Plus has up to 8 textures. Milk temperature settings: Creatista has only up to 3 milk temperature options whereas Creatista Plus offers up to 11 options. Coffee recipes: Both Creatista and Creatista Plus can automatically make different coffee drinks. Offers programmable beverages and it has a color screen that displays the density of milk. Has a beautiful design and comes in both stainless steel and plastic. Has an automatic steam wand that is self-cleaning and efficient in making Latte Art. Customized barista-style drinks upon the touch of a button. The machine applies superior technology, and it proves to be very costly. For lovers of fancy custom espresso beverages, the Nespresso Creatista Plus by Breville is the perfect machine because it takes milk frothing experience to a whole new level. It is made such that it can brew your coffee with enhanced flavors and great taste. Compared to other conventional milk frothers, it produces better creamy cappuccinos and velvety smooth latte. The best part is that its heat-up time is only 3 seconds and this saves time as compared to other machines. Automation ensures coffee wastage is zero-rated and this makes it the best in the market so far. The appliance can be used at home or in the office. Can you use a paper towel as a coffee filter? Coffeesupremacy.com participates in the Amazon Services LLC Associates Program, an affiliate advertising program designed to provide a means for sites to earn advertising fees by advertising and linking to Amazon.com. Coffee Supremacy © 2019. All Rights Reserved.